Microscopes for kids are great purchases as they can get children interested in all things related to science. To make the first experience of using a microscope really interesting, we recommend that you start with a good, quality beginner’s microscope. There are some really good microscopes for kids nowadays at a fraction of the cost of a professional microscope. A good beginner’s microscope is made of durable materials and has metal frames. It should also have a built-in light source, various zoom levels and good optics that can provide good, sharp images. It's important to choose a kids microscope that can provide a good image. A good image can really inspire a child and get him or her interested in science while a blurry image from a cheap microscope can make the first microscope experience boring. By the way, there two types of microscopes: high power and low power. Low power microscopes (magnifications ranging from 10x to about 80x) are used to look at larger things like insects, fabric weaves, coins or stamps. High power microscopes go up to 1000x and can be used to look at smaller things like pond water, bacteria or even blood cells. High power microscopes are usually more interesting as they allow children to see much smaller things. A good kids microscope must also be easy to use (but not so easy as to be uninteresting). It should have easy to understand dials and the microscope’s head should be easy to raise and lower in order to get a specimen into focus. It should also contain instructions and contain accessories that kids can use to perform experiments and various hands-on science activities. Children should also learn to take good care of the kids microscope to avoid damaging it. A microscope should always be carried around with both hands. It should be kept clean and the lens should be cleaned using soft linen so that it doesn’t accumulate dust. It should also be stored in a dry place. By the way, don’t hesitate to help your child use the microscope! One microscope that is sure to nurture the children's interest in science and that we recommend is the My First Lab Duo-Scope Microscope (ages 8 and above). It is relatively inexpensive, it is durable, it has good glass optics and yields a good quality image. It has magnification of 40x, 100x and 400x. It comes with a 50 piece accessory kit which includes slides, lens paper, a plastic test tube, a pair of forceps and more. Another microscope that we recommend is the Thames and Kosmos Tk2 Scope (ages 8 and above). 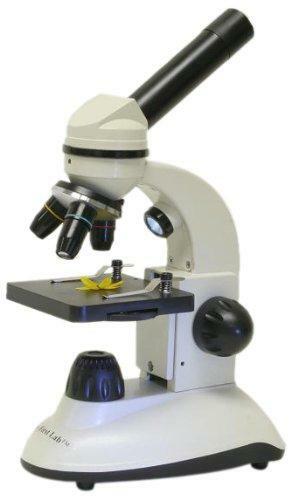 It is a sturdy and powerful microscope at an affordable price. Another thing that we like about this microscope is that it includes a useful manual that teaches kids how to use the microscope and prepare the slides. The kits also includes over 20 accessories and tools. The microscope magnification goes up to 400x.